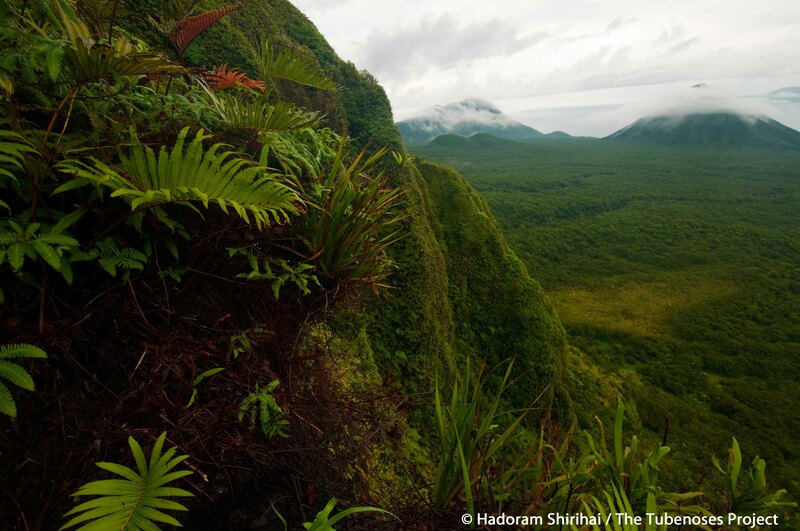 We have just completed an extraordinary research expedition to Vanuatu. Our main focus was collecting additional material for our taxonomic investigation of the brevipes-leucoptera complex, within the gadfly petrels. 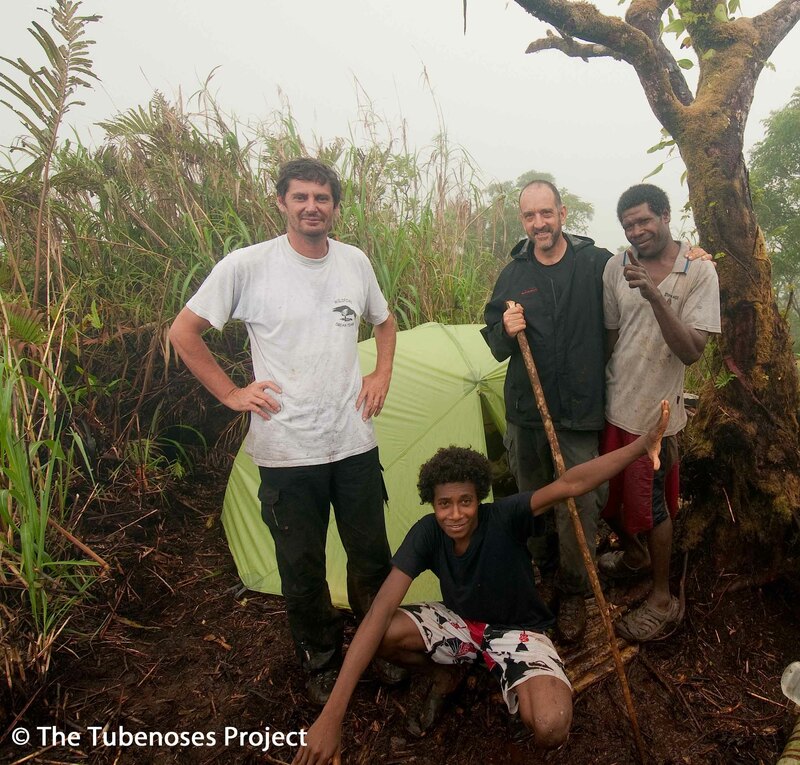 Our first major expedition to this region was conducted in December 2009–January 2010, and on this occasion we again reached the remote Banks Islands, in the north of Vanuatu. There we tried to relocate and study our new petrel, which we have recently named and described as a new taxon to science, the Magnificent Petrel Pterodroma (brevipes) magnificens (for full details see Bretagnolle & Shirihai 2010). Magnificent Petrel, April 2011, off Mota Lava Island. The smallest but most attractive of the gadfly petrels – and endemic to the Banks Islands, North Vanuatu! Note the combination of small, delicate appearance, particularly the slender bill and body, and proportionally longish tail. The Magnificent Petrel occurs almost exclusively in this dark form (in at least 99% of the individuals examined); note also the predominantly dark underwing with a very broad black diagonal band and grey greater-coverts, leaving an extremely limited pure-white covert area. The new data and some of the discoveries made on our latest expedition (especially from northern Vanuatu but also from elsewhere from Western Pacific) will be analysed and published in the ornithological literature before becoming available in full to the public. However, we are delighted to give a taster of some of our findings and photos now. This expedition was easily the most challenging of our careers, but also one of the most successful, especially regarding the new discoveries we made on the way. During a pelagic search in the Banks Islands, especially off Gaua, Vanua Lava and Mota Lava Islands, we found in the space of just three days no fewer than 107 Magnificent Petrels, and counted 420 Vanuatu Petrels P. (cervicalis) occulta. Vanuatu Petrel, the other endemic gadfly petrel of the Banks Islands, April 2011, off Mota Lava. This petrel was first collected in 1927, but it was only seen alive at sea in 2006 (by the authors); on the latest expedition more than 400 individuals were counted at sea, and good numbers of birds were studied at night at the colonies in Vanua Lava. Many birds were documented with the most advanced camera equipment, with issues of plumage variation, moult and ageing of the petrels being the main target in these observations. We also collected data on oceanic distribution, pre-evening inland penetration, gathering behaviour, movement and feeding behaviour. To see video footage of the team in action at sea, click here! 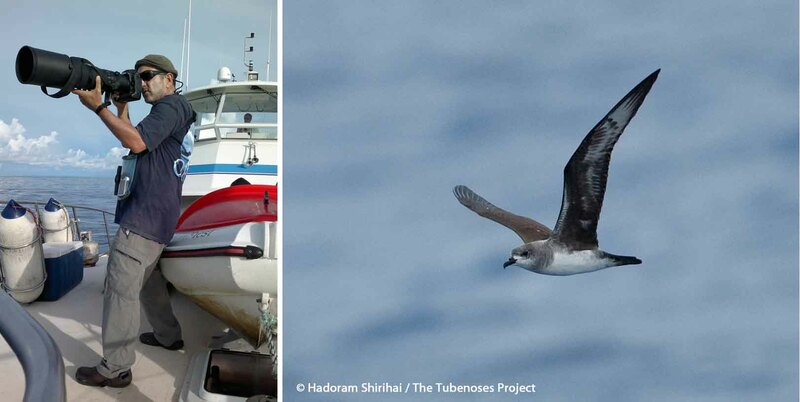 (Left) Hadoram during the pelagic survey, documenting plumage variation and behaviour of the petrels; (right) Herald Petrel Pterodroma heraldica was among the surprises during the pelagic – a truly rare breeder or vagrant in the West Pacific. April 2011, off Mota Lava Island. Following an earlier 2011 expedition conducted by scientists from Australia (S. Totternam) and New Zealand (Colin Miskelly and Alan Tennyson), and partly with the same local guides, we reached the highest volcano complex of the Island of Vanua Lava, Banks Islands, where we were able to confirm our 2009 discovery of the Magnificent Petrel’s breeding island. With three islanders we climbed the forest in Vanua Lava Island, entering the complex of the volcano, Qwelrakrak. Here we are crossing the volcanic sulphur fields at the base of the caldera. 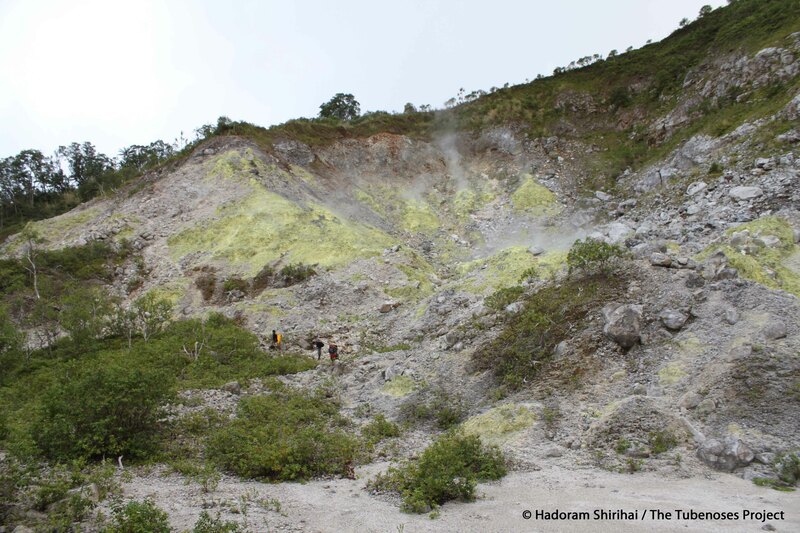 The location of the breeding colony is suspected to be on a very steep cliff (inaccessible by all means); this forms part of the caldera of a still partially active volcano! Despite this sizeable challenge, and with the help of three local villagers, we camped out, spending four nights on the top of the caldera, just above the colony and where non-breeding birds were making powerful nocturnal aerial displays. The breeding locality of the Magnificent Petrel, a cliff top on Qwelrakrak Volcano’s caldera on Vanua Lava, Banks Islands. Each night, between 20 and 40 Magnificent Petrels were involved in these impressive and highly vocal flight displays – to hear some of these extraordinary calls, click here: the deep call is of the female, followed by an unsexed bird uttering ‘machine-like’ tig-tig calls; these may also function to help the birds avoid crashing into each other in the dark! By comparison, during the initial discovery of the breeding location on the 2009–10 expedition, only 5–10 birds (presumably breeding adults) were displaying at this location in December (some also gave ground calls). 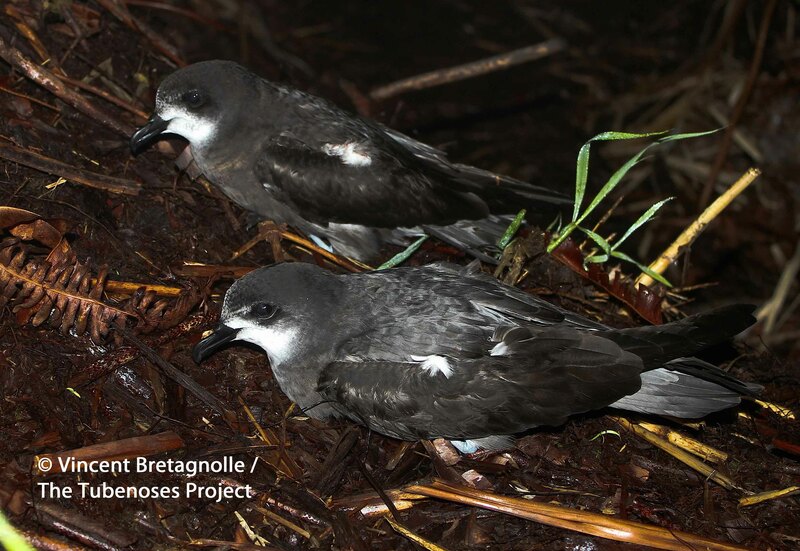 The possible differences in the age-class and display behaviours between the two expeditions – December (adults) versus April (non-breeders) – augment our hypothesis that the Magnificent Petrel is a summer (instead of winter) breeder within the brevipes-leucoptera complex. Magnificent Petrels on Vanua Lava Island. We managed to mist-net quite a few of the displaying petrels, allowing us to collect highly valuable biometric data, to perform DNA sampling, and to photograph all the Magnificent Petrels we trapped. Many hours of tape recordings were collected for acoustic investigation too. 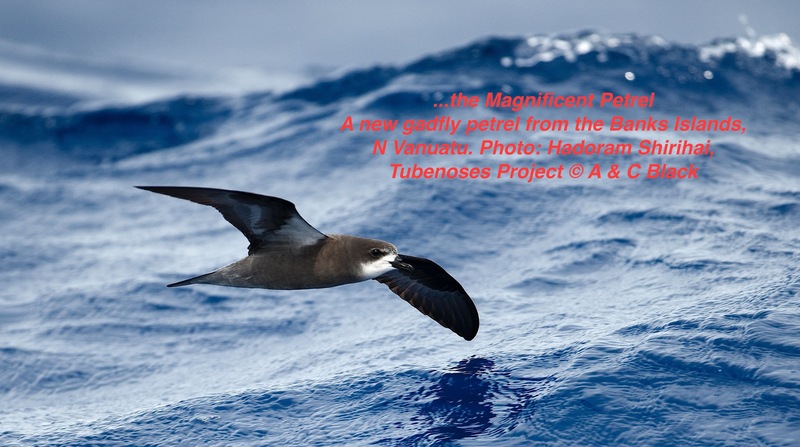 The new data will help to refine the taxonomic relationships and taxonomic rank of the Magnificent Petrel. A Magnificent Petrel on Vanua Lava Island. When handled, Magnificent Petrels are very calm, almost as if they are ‘allowing’ examination. Birds were trapped for measurements and blood sampling. Note the broad diagonal black underwing-band, leaving a limited pure-white covert area. Magnificent Petrel on Vanua Lava, an extreme dark individual with a smaller white facial area; note the typical dark bluish-grey below. During the work on Vanua Lava Island, we also took biometric and acoustic data and carried out genetic sampling of the Vanuatu Petrel, from the recently discovered breeding colony of this petrel – these data will complement current studies of this petrel lead by the Australia/New Zealand team mentioned above, along with local islanders of Vanua Lava. A report on the first at-sea sightings of Vanuatu Petrel as well as on identification and variation in the taxon can be found here. This was a difficult and challenging expedition, with some serious life-risking situations for us to deal with. 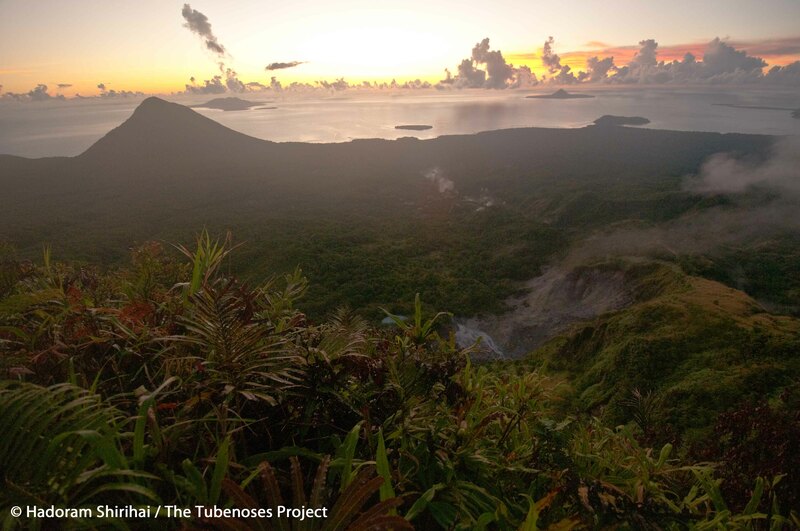 Perhaps the most dangerous was a night escape from a volcanic sulphur eruption. 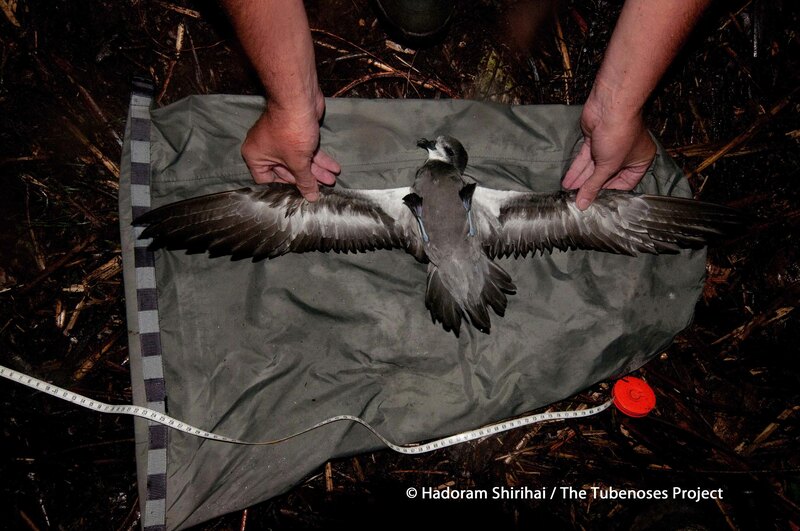 At midnight on 26th April, while Vincent was located at the bottom of the caldera (to improve acoustic conditions for recording Vanuatu Petrels at night) and Hadoram was trying to monitor and capture displaying Magnificent Petrels at the top, there was a steaming eruptive event, with dramatic increases of air temperature and the release of toxic gases. The dense volcanic cloud trapped Hadoram, unfortunately while he held two Magnificent Petrels in his hand. Vincent managed to run away back to the forest, escaping intoxication, but stuck at the top of the caldera, Hadoram had no choice other than to take the two petrels into his sealed tent, and to wait for a few hours with a gas mask attached to his face until the air had cleared up. Hadoram also tied a wet towel around the heads and bills of the two Magnificent Petrels to protect them from the gases. Only at about 03.00 the next morning had the gases dispersed and the air cleaned up; at this point the two Magnificent Petrels were released safely, unharmed. 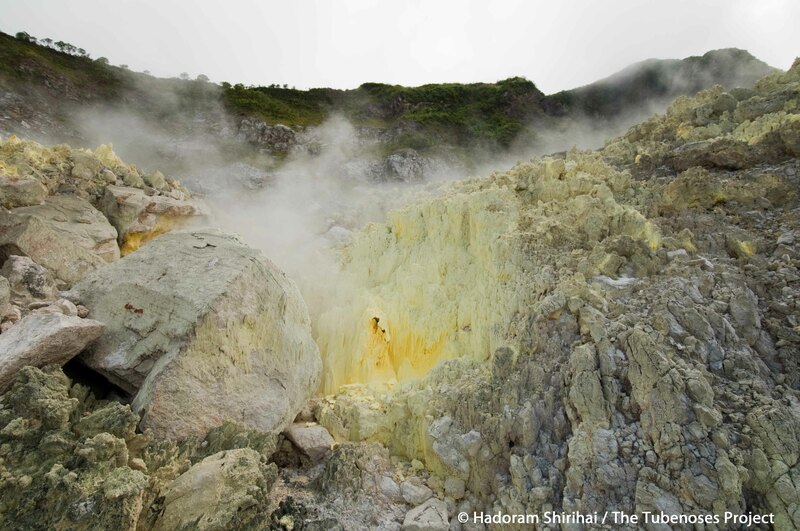 The source of the sulphurous volcanic eruption on Qwelrakrak. In addition to our discoveries, and work on Magnificent and Vanuatu Petrel biology mentioned above, the expedition was invaluable for the completion of collecting information on all the known populations of the brevipes-leucoptera complex of gadfly petrels, including at-sea chumming photographic documentations, biometrics, acoustic and genetic data, and which hopefully will help to reveal some of the secrets of these incredible and still little-known seabirds. Sunrise at the breeding locality of the Magnificent and Vanuatu Petrels, at the top of the Qwelrakrak caldera, Vanua Lava. The bottom of the caldera is still steaming away after the midnight eruption. To view Driven by the Petrels, a short (and fairly amazing) movie summarising events on the first leg of the expedition to the Banks Islands discussed above, click here! Hadoram Shirihai and Vincent Bretagnolle are the authors of the forthcoming Albatrosses, petrels and shearwaters of the world: a handbook to their taxonomy, identification, ecology and conservation, and Field Guide to the Seabirds of the World, both published by Christopher Helm. 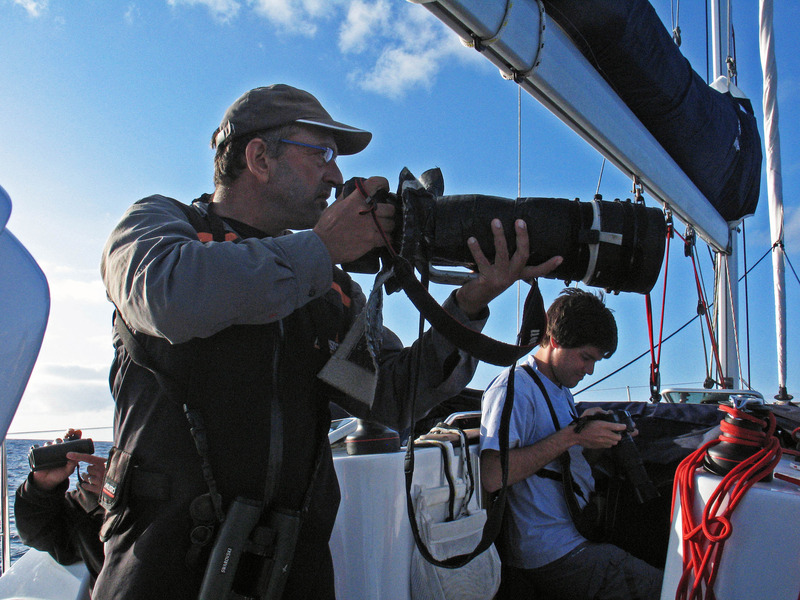 Extreme Gadfly Petrel Expeditions Ltd is a non-commercial body with the specific goal of searching for and studying the least-known and rarest species of albatrosses, petrels and shearwaters, and to increase awareness for the conservation of seabirds in general. 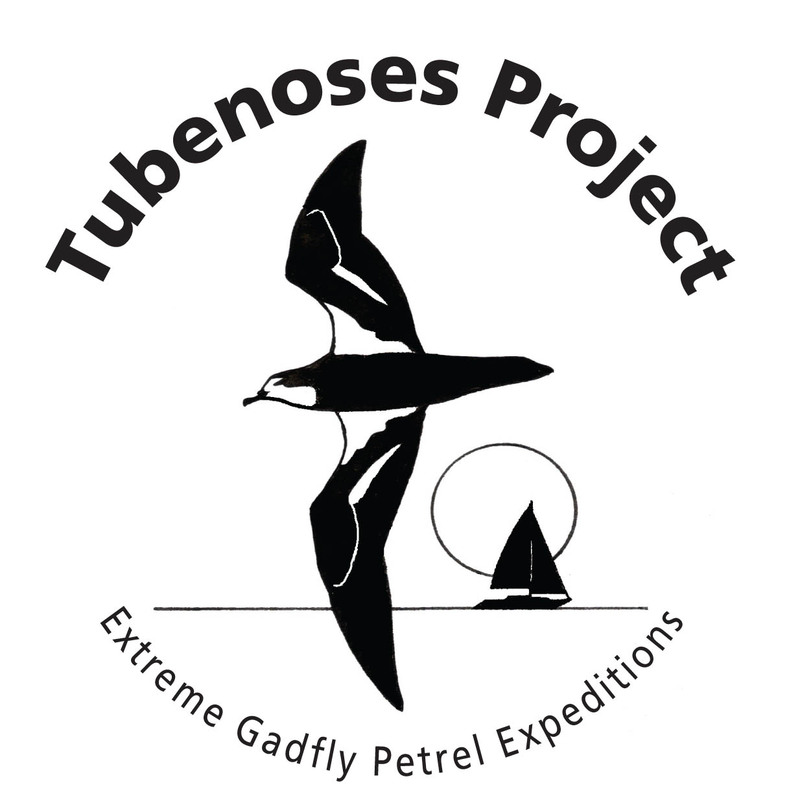 Extreme Gadfly Petrel Expeditions and the Tubenoses Project perform two or three major research expeditions to remote waters and islands every year. Vincent (left) and Hadoram (centre top), with some of the Lalngetak islanders that are protecting and assisting the study of the petrels on Vanua Lava, Manman (right) and Brown (centre below), with the photo taken by Jackson. For Mike Imber: The authors dedicate the expedition and this report to the memory of a recently lost friend and collaborator, Mike Imber (New Zealand), who died while the current expedition was taking place. Mike’s contribution to petrel ecology and conservation had no match, and we both owe him a lot. We were deeply saddened to hear of the loss of Mike; the petrel community has lost a true authority. I read an interesting paper yesterday that will appear in the next edition of Bulletin of the BOC. It’s co-authored by Hadoram Shirihai – A&C Black author, fearless adventurer and probably my favourite ornithologist. Perhaps the most difficult of all bird groups to separate to species is the seabirds, and this is where Hadoram’s specialism lies. While he does his share of museum work, Hadoram is happy to head out into the field to look for things himself, often in spectacularly demanding conditions. And what can be tougher than spending week after week far out at sea, up and down and up and down among the choppy waves, doling out barrelfulls of a mixture of fish oil and fish guts to tempt in shearwaters, petrels and storm-petrels? For a firmly committed land-lubber like me it simply doesn’t bear thinking about. The fruits of this hands-on approach to seabirdology are impressive. 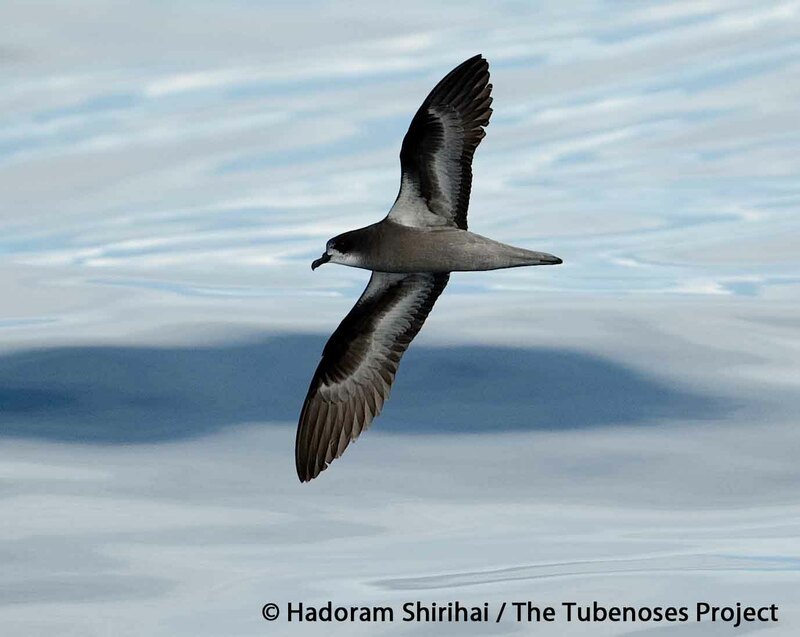 Recent investigations include the first at-sea identification of Zino’s Petrel off Madeira, and some sensational rediscoveries of species ‘ lost’, presumed extinct. 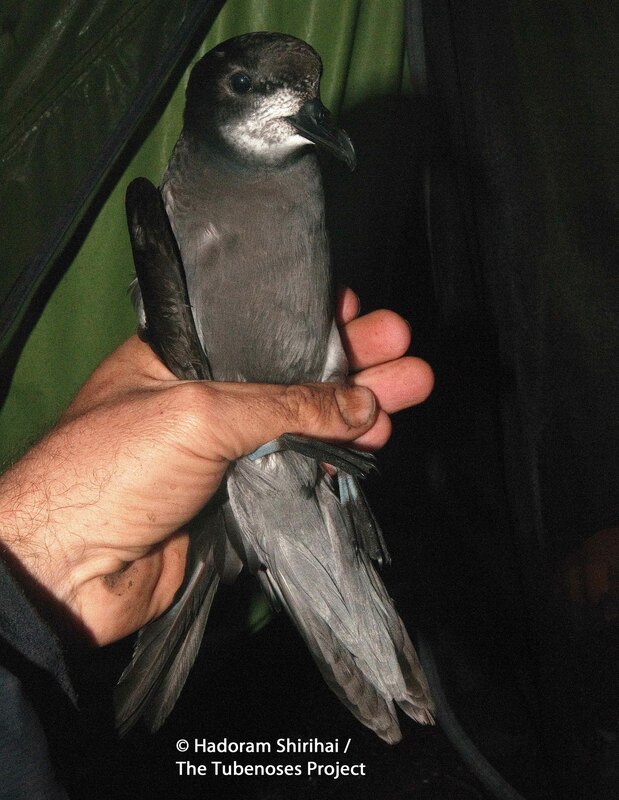 While the search for Jamaican Petrel was fruitless (this one really does seem to be a goner), Beck’s Petrel – a diminuitive version of Tahiti Petrel – was rediscovered by Hadoram off the coast of New Ireland in 2007, 79 years after the last (and indeed first) record. 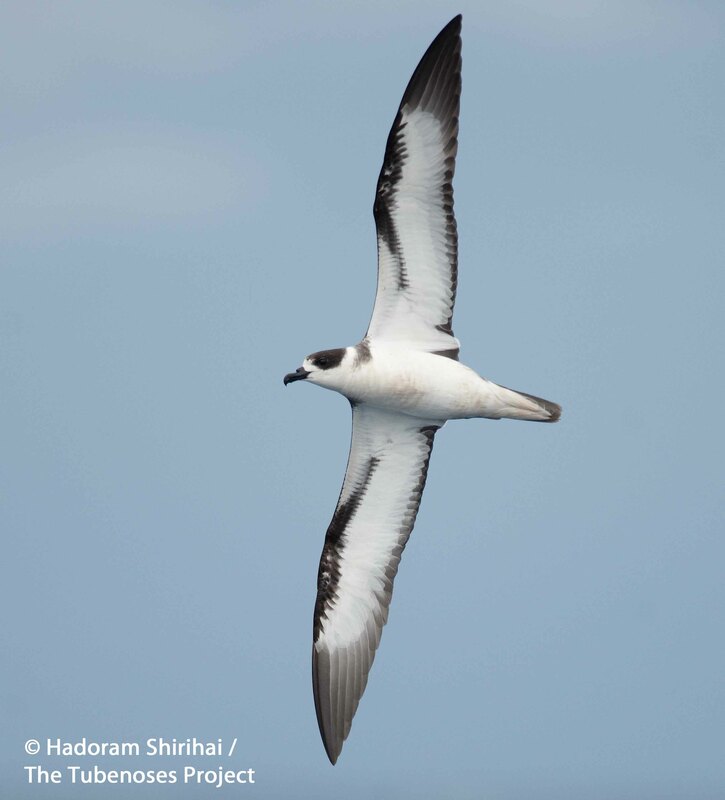 And in this latest paper he’s hit the jackpot again, with the discovery of a new ‘taxon’ related to Collared Petrel, found in surprising numbers off the coast of Vanuatu in the eastern Pacific. Bretagnolle and Shirihai dub the new bird the Magnificent Petrel, and here’s why. Pterodroma (brevipes) magnificens - what a bird. This beauty was photographed in a mixed-species seabird flock, along with Wedge-tailed and Audubon’s Shearwaters, Sooty Terns, ‘tens of noddies’ and Red-footed Boobies. Imagine that. The authors haven’t plunged in to state that its a new species, though there seem to be good grounds for it to be so (and there is DNA work in prep.). I like seabirds a lot. Though to my shame I have never actually seen one. I realise this is bad. I thought I saw a Herald Petrel when I was on Rarotonga last year, but it turned out to be a frigatebird – a new low in a litany of misidentification. A glimpse of a golden dragon?